Thank you for visiting In Memory Of. Please feel free to add your comments to our Visitor Book or leave a tribute to a loved one. Thank you. Author: Yvonne Holland - Of Strathaven, Scotland. Author: sarah mahood - Of birmingham, england. Author: sarah colder - Of birmingham, england. From: john atherton - newcastle upon tyne, england. Entry recorded on Friday, 25 November 2005 at 21:45. Entry recorded on Thursday, 24 November 2005 at 21:56. From: pennie cole - cleburne, u.s.. Entry recorded on Saturday, 19 November 2005 at 00:49. Entry recorded on Saturday, 19 November 2005 at 00:46. Dear sarah I miss you so much I can't wait to see you again and just hold you I know you are looking down on us keeping us safe and out of trouble and by the way I still know how to spell "MACHINE" I love you very much I will see you soon someday love your big brother brandon. From: Brandon Sanders - Greenville, usa. Entry recorded on Friday, 18 November 2005 at 05:14. From: Sheila - Lubbock, USA. Entry recorded on Wednesday, 16 November 2005 at 21:00. From: jon - london, england. Entry recorded on Thursday, 10 November 2005 at 22:02. From: David Williams - farnborough, Uk. Entry recorded on Tuesday, 8 November 2005 at 23:56. From: James - New York, united states. Entry recorded on Tuesday, 1 November 2005 at 07:27. From: zoe abery - reading, uk. Entry recorded on Monday, 24 October 2005 at 18:01. I miss you David. It's almost four years since you passed away. Every day has been a challenge for me but I am doing the best that I can. I'm learning how to live with the pain. Love Mom. From: Sherry - New Westminster, Canada. Entry recorded on Thursday, 20 October 2005 at 02:11. From: amanda - hull, uk. Entry recorded on Thursday, 13 October 2005 at 23:55. From: stephanine - glasgow, scotland. Entry recorded on Wednesday, 14 September 2005 at 18:05. Entry recorded on Wednesday, 14 September 2005 at 12:25. From: Meghan, Ciara & Daiel Kelly - Glasgow, Scotland. Entry recorded on Saturday, 3 September 2005 at 09:10. Entry recorded on Saturday, 3 September 2005 at 09:09. Entry recorded on Saturday, 3 September 2005 at 09:08. From: Annemarie Kelly - Glasgow, Scotland. Entry recorded on Saturday, 3 September 2005 at 09:02. From: Deborah hobbs - london, uk. Entry recorded on Sunday, 7 August 2005 at 06:38. Thanks a lot for a nice good work! From: Elissa - New York, USA. Entry recorded on Wednesday, 22 June 2005 at 10:52. From: maureenEntry recorded on Thursday, 9 June 2005 at 10:29.
in memory of marjorie wheeler. Mum we miss you so much.there's not a day that we dont think of you god bless you until we meet again. love dad sandra sue roy cassie mick. From: sue brophy - wembley middlesex, England. Entry recorded on Sunday, 5 June 2005 at 12:48. From: Peter - WolverhamptonEntry recorded on Thursday, 28 April 2005 at 16:29. From: dave - newcastle, united kingdom. Entry recorded on Monday, 25 April 2005 at 22:19. Entry recorded on Monday, 28 March 2005 at 18:37. From: PeterEntry recorded on Friday, 18 March 2005 at 11:11.
those words are so true mother. Entry recorded on Saturday, 12 March 2005 at 11:44. From: lorraine - high wycombe, bucks. Entry recorded on Saturday, 26 February 2005 at 21:36. From: InMemoryOfEntry recorded on Wednesday, 9 February 2005 at 16:35. From: Peter - WolverhamptonEntry recorded on Sunday, 6 February 2005 at 14:04. Entry recorded on Sunday, 9 May 2004 at 00:04. Entry recorded on Saturday, 8 May 2004 at 23:59. Entry recorded on Thursday, 29 April 2004 at 13:56. From: Kate - London, England. Entry recorded on Thursday, 29 April 2004 at 13:43. Entry recorded on Thursday, 29 April 2004 at 13:42. A Good friend taken away to soon by a drunk driver. We miss your big smile and that great laugh. From: friend - pottsville, usa. Entry recorded on Wednesday, 21 April 2004 at 02:42. We have been experiencing difficulties with our server. 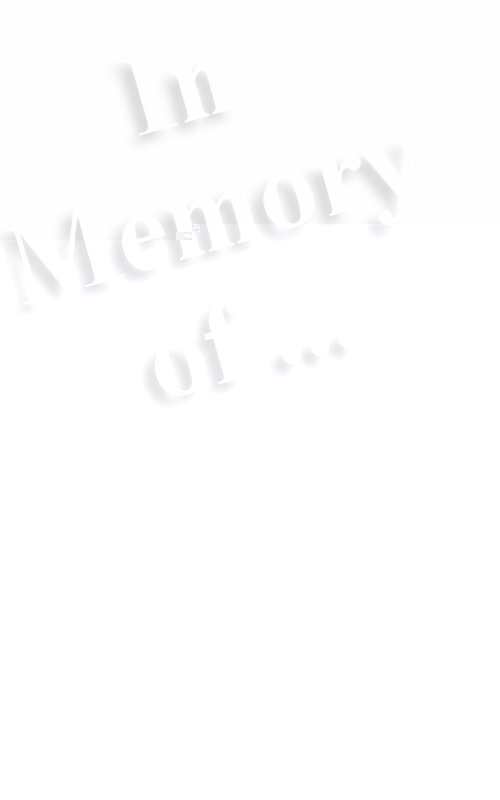 Some memorials have been deleted. If you have copies of memorialos please forward to us. From: Peter@inmemoryof - Wolverhampton, UK.Entry recorded on Wednesday, 17 March 2004 at 09:51. In loving memory of my mother, Jean McGill. She was a wonderful, wonderful woman. Taken from her family too soon, but now we know that she is finally resting peacefully. We love you!!! From: Jennifer Burke - Newtown, USA. Entry recorded on Thursday, 26 February 2004 at 21:51. From: YVONNE - NEW YORK, U.S.A.. Entry recorded on Thursday, 29 January 2004 at 02:49. In Loving Memory Of Jimmie Wade Jones JR. He will always be in my heart and all the people that loves him. We will all miss him and and always love him. One thing we will not do is forget him i will always love you Jimmie Jones JR.
From: Jessica - Bedford, USA. Entry recorded on Saturday, 24 January 2004 at 20:46. In Loving Memory Of Jimmie Wade Jones JR. He will always be im my heart and all the people that loves him. We will all miss him and and always love him. One thing we will not do is forget him i will always love you Jimmie Jones JR. Entry recorded on Saturday, 24 January 2004 at 20:45. From: Wendy Carew - St. Johns, NL, Canada. Entry recorded on Tuesday, 13 January 2004 at 02:10. Survived by his Daughter,Mother, Nephew and 2 sisters;Hazel,Marie and various other relatives and friends he had made in his short life. Time does not make us forget, we miss and love you dearly. Entry recorded on Monday, 15 December 2003 at 14:10. From: sonya - shropshire, england. Entry recorded on Tuesday, 9 December 2003 at 21:20. In loving memory of my baby sister, Zorlevia. Everyone misses you so dearly. She was a beautiful young lady, that went home to God on September 2, 2003, from congestion heart failure. Rest in peace. From: Yarteca Holloway - Detroit, USA. Entry recorded on Friday, 14 November 2003 at 07:03. From: JULIE JOLLEY - windsor, england. Entry recorded on Wednesday, 1 October 2003 at 20:54.
country so we could all live in peace. From: JOHN ATHERTON - NEWCASTLE UPON TYNE, UK. Entry recorded on Monday, 22 September 2003 at 10:06. From: THE ROBERTSONS - GARFIELD, BERGEN. Entry recorded on Saturday, 20 September 2003 at 04:52. From: Richard Berry - Lymington, United Kingdom. Entry recorded on Thursday, 18 September 2003 at 21:56. From: Manuel - Madrid, Spain. Entry recorded on Wednesday, 3 September 2003 at 11:38. Creative website. I enjoyed browsing. Entry recorded on Tuesday, 19 August 2003 at 11:06. From: Sarah Balman - Medway, Kent. Entry recorded on Thursday, 22 May 2003 at 15:13. Entry recorded on Thursday, 15 May 2003 at 16:54. From: Pavol Knurovsky - Kosice, Slovakia. Entry recorded on Thursday, 15 May 2003 at 15:46. From: MGBADA JOE,ABA,,NAIJA - ABA,, NAIJA. Entry recorded on Monday, 3 March 2003 at 15:53. Entry recorded on Monday, 3 March 2003 at 15:52. Entry recorded on Monday, 3 March 2003 at 14:25. IN LOVING MEMORY OF OUR DEAR MOTHER FLORENCE MAY SCOTT (NEE ATHERTON) WE HAVE LOST HEAVEN HAS GAINED ONE OF THE BEST THIS WORLD CONTAINED.LOVED AND REMEMBERED ALWAYS AND NEVER TO FORGET FROM ALL THE FAMILY. MEMORIES ARE KEEPSAKES TO TREASURE FOREVER. Entry recorded on Monday, 3 February 2003 at 14:55. From: Marilyn - London, uk. Entry recorded on Saturday, 25 January 2003 at 23:52. I think this is one of the better memorial site on the net. Well done! From: Paul - Wolverhampton, UK.Entry recorded on Monday, 9 September 2002 at 14:21. My cousin Nina Lawrence died at the age of 8 and a 1/2 in her sleep. She would be 32 if she was still alive to this day. Let God pretect her well. Entry recorded on Sunday, 11 August 2002 at 14:10. From: carol curry - swansea, uk. Entry recorded on Saturday, 10 August 2002 at 20:58.
my beloved mum died 2yrs ago today.i still cant face up to it and go into a panic if anyone or thing makes me remember she,s gone. i miss her so much. she died of cancer and although we knew the end would come nothing prepared me for her to go so suddenly.i thougt we would get time to say goodbye. family caused trouble whilst she was ill and after she died they desecrated the funeral. How do you get through? From: SAMANTHA KARNOVSKI - chatham, uk. Entry recorded on Friday, 28 June 2002 at 00:35. I lost my dear mum last year, i feel the same pain every day since she has died. After finding this site i see i am not alone god bless you all. From: kieran waters - newry, ireland. Entry recorded on Thursday, 16 May 2002 at 22:53.
my beautiful sister died on july 18,2000 saving her 9 year old from drowning she gave her life so her daughter could live and she is a hero,we all miss you deeply,and our grief shall never fade. From: christine reed - hagerstown, usa. Entry recorded on Sunday, 28 April 2002 at 15:39. From: AnonEntry recorded on Monday, 4 February 2002 at 12:34.
well i write once again for such a great site, i have two tributes under "R" and i get great warmth from a regular look... i only wish that more would send in their tributes. i try to tell all i know to do this, as i think its like visiting the Cemetry. you feel as though you are amongst friends...once again all those in the making of this site from the Rogers family "A BIG THANK YOU" keep it up lads. From: Jonathan - London, England. Entry recorded on Thursday, 24 January 2002 at 23:02. My baby went home to Jesus on May 18th, 1999. ATV accident. He had just turned 14. THERE IS NO GREATER PAIN!!!!!!!!! From: pat unzicker - palm bay, USA. Entry recorded on Wednesday, 24 October 2001 at 03:37.
i feel for all those familys that lost loved ones in the terroist attack in america, and send my love and prayers to you all. From: zoeann - reading, uk.Entry recorded on Tuesday, 18 September 2001 at 22:25. From: David - CoventryEntry recorded on Thursday, 30 August 2001 at 11:56. From: Chris Topper - Perth, Scotland. Entry recorded on Saturday, 26 May 2001 at 09:11. From: Christine Thurman - Loughborough, United Kingdom. Entry recorded on Saturday, 31 March 2001 at 16:31. From: jennifer thomson - fife, scotland. Entry recorded on Monday, 12 March 2001 at 00:07. We have updated the Visitor Book. We will shortly be updating all of the Visitor books to look the same as this one. Thank you. From: Mark Wakefield - Worcs, UK.Entry recorded on Thursday, 22 February 2001 at 14:40. From: Mark Wakefield - Worcs, UK. Entry recorded on Thursday, 22 February 2001 at 14:38. What a lovely idea.Celebrating someone's life keeps the happy memories alive. As someone who tends graves for a living, I found this a particularly poignant yet welcoming site. This is a wonderful place to walk around. It is nice to come back and read somemore wonderful life stories. The changes to the site were a pleasant supprise. I found some useful information on your links page. Thanks. It is refreshing to see a site dedicated to people's memories, which really makes you want to come back again and again - if only to read the lovely stories. Volevo solo ricordare una persona stupenda: mio nonno !Ciao Alfredo. I was amazed at the speed of the search engine. I really like the changes you have made to the site. The addition of music and the search engine makes the site more 'friendly'. Keep up the good work. As a Funeral Director, I think that with more people learning every day about the Internet, and how to use it to their advantage, this innovative idea will eventually become an invaluable service. However, I think it will take a long time to achieve this. I Wish you well. I really like your site. Have you got a section for pets? Just testing this guestbook. What a really great idea. This is a test entry to show how the guest book works. You can write your tribute in the space provided on the guest book form - then press SEND and it will appear on this page. Please try it and see for yourself how simple it can be. It is a very personal way of expressing your feelings for the deceased person which can then be shared with other visitors to the guest book. © In Memory Of 1999 - 2005. All rights reserved.